HONG KONG—The two teams that finished down the standings in the 2014-2015 CIHL regular League showed their metal in the first leg of the 3-leg playoffs at Mega Ice on Saturday Feb 14. Both matches were played in a fast, energetic fashion with end-to-end hockey as if there was no tomorrow, giving enormous pleasure to the fully engaged spectators. In the first match between the CIHL league winners Macau Aces and Hong Kong Tycoons, Aces eased into a 2-1 lead at the end of the first period with goals by Ryan Wong and Whitney Olsen while Brad Smith kept Tycoons in close contact with a score mid way through the period. Tycoons strategy in this match was clear, dropping Brad Smith back into a defending role was a great move for them as he snuffed out many of the Aces attacks long before they became a real threat. He then distributed the puck up-ice for their front men to cause havoc in the Aces goal area resulting in a score after 4-minutes of period-2 for Jonathan Szychta and goals for Joel Ankarberg after 6 and 8 minutes of second period play putting the Tycoons into a 4-2 lead. In the 3rd stanza, after the ice-cleaning break it was tight play by both teams right through the 12-minutes of play. Tyler Doherty scored for the Aces to narrow the gap, but Szychta replied at the other end just 30 seconds later to keep the 2-goal buffer which they maintained until the end of the match. 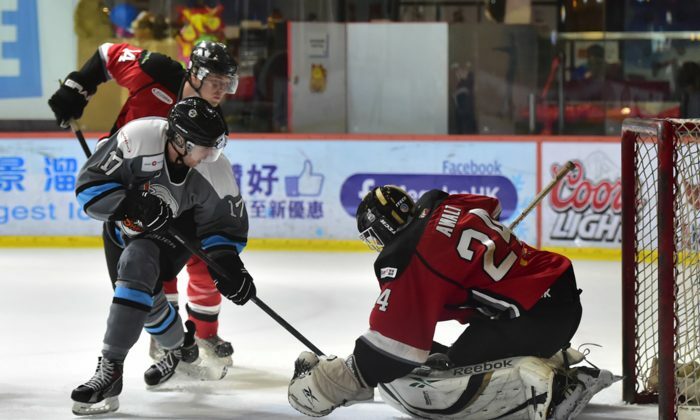 South China Sharks finished runners up in the CIHL regular season league, but they also had a tough evening playing Kowloon Warriors in a match played at ferocious speed and with great determination by both sides. The pace did not slacken during the whole of the game with the players coming off at the ice cleaning break gasping for air and eager for a rest. Like Tycoons, Warriors had done their homework on the Sharks’ squad, effectively cutting off the attacks of Jordan So, Sharks’ key goal scorer. Warriors’ Eric McKenna was the only scorer in period-1. But in the session-2 the game opened up with a flurry of goal activity. Victor Kruger scored for Sharks to level the score Gregory Smyth hit back for the Warriors 1-minute later to push Warriors back into the lead. Kevin Tersigni evened the game for the Sharks’ to 2-2 before McKenna got on target twice more towards the end of the period to give Warriors a 4-2 lead at the ice cleaning break. Smyth and Jake McDonnell each added scores early in the 3-rd period to give Warriors a 3-goal cushion and although Ronald Mathez posted an additional goal for Sharks, Warriors held on to win 6-3. The second round of the best-of-three semi-finals take place at Mega Ice this coming Saturday, Feb 28.